Grantham enter the final month of the season looking to make it three games unbeaten as they face the in-form Lancaster City. It was a crucial win for the Gingerbreads at home to Witton Albion last weekend with Jack McGovern grabbing the late winner, when his speculative shot from the edge of the box was fumbled over the line by the Albion custodian Greg Hall. The win proved vital as sides below Grantham dropped points to see Paul Rawden's men move eleven points clear of the relegation zone and rise as high as 15th in the table, although the gap was cut to eight points on Tuesday night following Mickleover's 1-0 win at Workington. 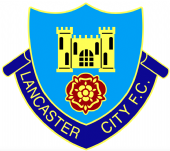 Home side Lancaster have had a similar season to the Gingerbreads and the Dolly Blues currently sit one place above Town in the table in 14th, with the sides separated by goal difference only. The Lancashire side have also been in excellent form recently, going unbeaten in their last five games including a 2-0 win against league leaders Farsley Celtic and a 1-1 draw last weekend at play-off chasing Scarborough Athletic. The earlier meeting in the year came during the middle of October in a 2-0 defeat at the Meres after goals from Matt Blinkhorn and Rob Wilson saw the Blues take the points back to Lancashire. Grantham boss Rawden has been encouraged with the way his side have played and says the only way is up for Grantham: "I've been really impressed with the way we have conducted ourselves in the two games just gone. "Of course we aren't safe yet, but the positive signs are there and we have taken four points from two difficult sets of opponents and will be looking to add that this weekend when we face another tough test. "Lancaster are in good form at the moment and have pulled off some good results against sides who are right at the top of the table. We won't take them for granted and we will be there to do one thing and one thing only. Win." Rawden has no new injuries reported. Sam Cartwright is still unavailable with his foot injury and Callum Coyle is still waiting on the scan results for his groin injury. Tom Ward has been at Aintree this week, getting some hints and tips from Tiger Roll's trainer Gordon Elliott in how he can keep the distance to the end of the season.  Town Triumph at The Meres Grantham Town returned to winning ways at home with a slender victory over Witton Albion at a sun-drenched Meres stadium on Saturday.